For other uses, see Granule (disambiguation). Detailed view of a sunspot and surrounding solar surface. The dense pattern of cells (unrelated to the sunspot) is granulation; the individual cells are granules. A closer view of the granules, with North America superimposed for scale. 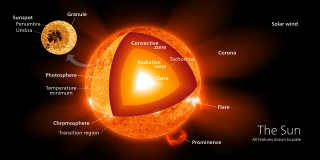 The rising part of the granules is located in the center where the plasma is hotter. The outer edge of the granules is darker due to the cooler descending plasma. (The terms darker and cooler are strictly by comparison to the brighter, hotter plasma. Since luminosity increases with the fourth power of temperature, even a small loss of heat produces a large luminosity contrast; this "cooler", "darker" plasma is still far hotter and vastly brighter than a thermite reaction.) In addition to the visible appearance, which would be explained by convective motion, Doppler shift measurements of the light from individual granules provides evidence for the convective nature of the granules. A typical granule has a diameter on the order of 1,500 kilometers and lasts 8 to 20 minutes before dissipating. At any one time, the Sun's surface is covered by about 4 million granules. Below the photosphere is a layer of "supergranules" up to 30,000 kilometers in diameter with lifespans of up to 24 hours. ^ Zirker, J. B. (2003). Sunquakes. Johns Hopkins University Press. p. 2. ^ Bahng, J.; Schwarzschild, M. (12 April 1961). "Lifetime of Solar Granules" (PDF). The Astrophysical Journal. 134: 312. Bibcode:1961ApJ...134..312B. doi:10.1086/147160. Retrieved 13 January 2016. This page was last edited on 19 February 2018, at 15:29 (UTC).